The Wild River Multi-Tackle Large Backpack features a lower tray compartment for storage of up to four #3600 style trays. In addition, large upper storage area with removable divider, which can convert the bag to a full size backpack for holding of larger items. A front pocket that folds down to provide a handy work surface. Large adjustable padded shoulder straps with sternum strap for all day comfort. This backpack holds up to six #3600 and four #3500 style trays. Lower tray compartment for storage of up to four #3600 style trays. Large upper storage area with removable divider, converts Backpack for storage of larger items. Front pocket cover folds down to provide a handy work surface. Large adjustable padded shoulder straps with sternum strap for all day comfort and fit. Clear internal pocket to keep your maps and licenses visible but dry. Capacity to hold up to six #3600 and four #3500 style trays. Base pads at bottom to reduce wear and help keep bag clean and dry. 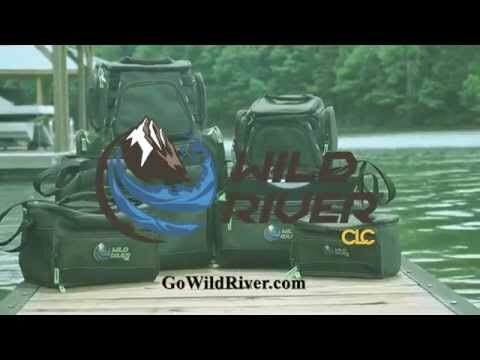 Wild River’s MT series backpacks and bags are covered by a limited lifetime warranty against defects in material and workmanship for the normal life of the product by CLC. This warranty does not cover normal wear, abuse, accidents, neglect, or damage caused by use of the product for a purpose other than intended. Warranty claims should be submitted through our website (www.gowildriver.com). Products suffering from defects in material or workmanship should be returned to CLC, freight prepaid by the sender. A Return Authorization is required. To submit a claim please select "Contact Us" from the main menu on our website. When the Contact window appears select "Return Authorization" from the dropdown box, fill in your contact information, and in the "Comments" box please enter the style number or UPC number of your item and describe the related defect. Customer Service will respond via e-mail with your Return Authorization number. When your return is received, we will either repair or replace the item in question, at our discretion.